The second generation of lithium disilicate (IPS e.max/Ivoclar Vivadent, Schaan, Liechtenstein) ceramics comprised smaller and homogeneous crystals. These characteristics improve properties such as fracture toughness and flexural strength, which allowed the preparation of posterior monolithic fixed prostheses. Another advantage of this system was the introduction of these types of ceramics in computerized processing [computer-aided design (CAD)/computer-aided manufacturing (CAM)] technology. CAD/CAM technology manages the design of a prosthetic structure in a computer (CAD) followed by its creation using a computer machine (CAM). The main objectives of this technology are to automate a manual process to obtain a high-quality restoration, standardize manufacturing processes, and reduce production costs. The zirconia ceramics are only manufactured using CAD/CAM technology, notable for their physical, mechanical, biological, and chemical properties. This material comes in two forms: (1) completely synthesized (hard) zirconia, which takes a long time to work and quickly depletes the milling burs, and (2) partially synthesized zirconia (soft zirconia), which allows for easier and faster processing. Since zirconia must be baked in a kiln after being milled by the CAD/CAM system, the contraction from baking must be compensated for at the time of milling. Alternatively, lithium disilicate does not contract when submitted to crystallization after milling. Thus, it is important to determine whether the marginal adaptation of single prostheses made using these two materials is similar, even considering the contraction of zirconia after sintering. This study aimed to evaluate the marginal fit of zirconia and lithium disilicate ceramic restorations processed by a CAD/CAM system. A standard metallic die was machined from a stainless steel metal bar, simulating a single unit crown with smooth axial walls, having 3° of convergence on each axial side [Figure 1], as described by Souza. The molds (n = 10) were used to obtain 10 plaster casts of Type IV gypsum (Elite Rock Thixotropic; Zhermack SpA, Rovigo, Italy), which were used to obtain the virtual casts to process 10 lithium disilicate (e.max; Ivoclar) and 10 zirconia crowns using the CAD/CAM technique. The dimensions of the models were scanned using inEos optical system (CEREC, Sirona Dental Systems GmbH, Bensheim, Germany). The margins were delimited in the software, and the infrastructure was designed [Figure 2]. After data acquisition, the scans were transferred to the software (CEREC, Sirona). The infrastructures were designed on 10 restorations that were customized with a thickness of 0.6 mm. 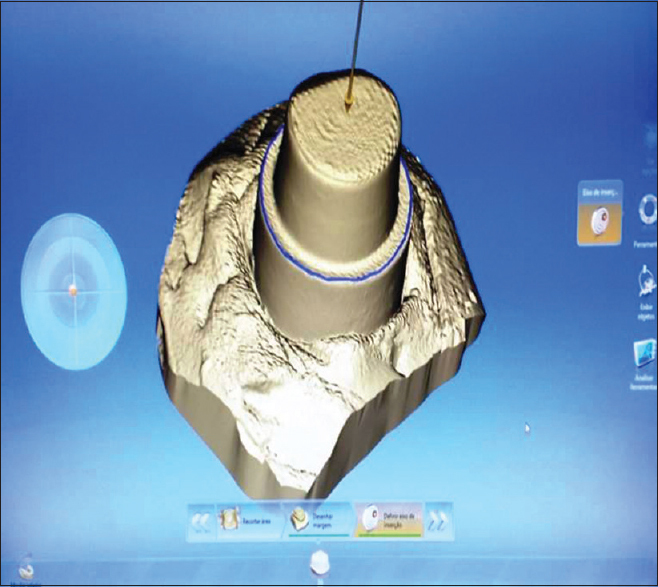 The prototypes were transferred to the CEREC mill (Sirona) [Figure 3] and the structures were milled using specific drills of each ceramic system. 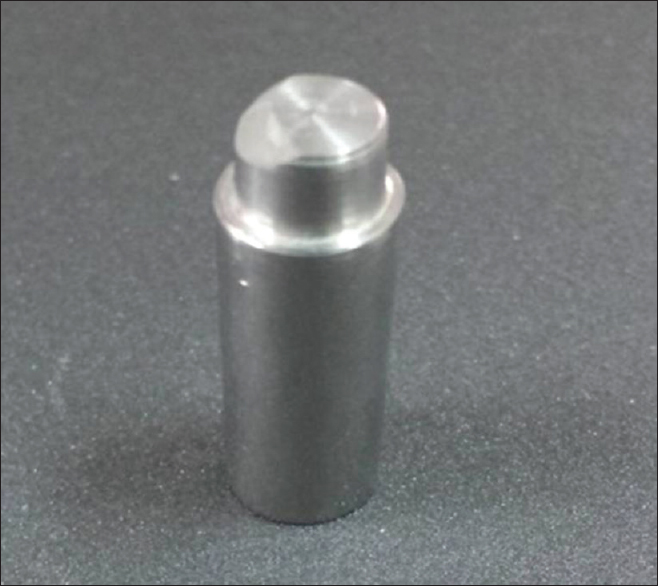 After milling, the lithium disilicate and zirconia specimens were baked/sintered (Programat; Ivoclar) following the manufacturer's recommendations. All measurements were performed by a single operator. The vertical marginal fit analysis was performed with the copings positioned on the metallic restoration under a constant force throughout the measurement process. The device allowed the rotation of the coping by 360° for reading the margin at the 12 previously marked points, and an arithmetic average was calculated using these values to obtain a single average value for each crown. The data were submitted to statistical analysis, at a significance level of 5%. The experimental variable analyzed was the marginal adaptation of the lithium disilicate and zirconia ceramic crowns fabricated using the CAD/CAM technique. The statistical analysis was performed using Student's T-test. There was no statistically significant difference in the marginal adaptation of the lithium disilicate (133.10 ± 26.87 μm) and zirconia (127.34 ± 47.97 μm) copings [Table 1]. The value of P for comparison of the type of packing material X adaptation (P = 0.7709). The null hypothesis was accepted, because there was no statistical difference in the marginal fit of lithium disilicate and zirconia crowns. There were no studies in the literature that evaluated these materials in vitro using the CEREC system. 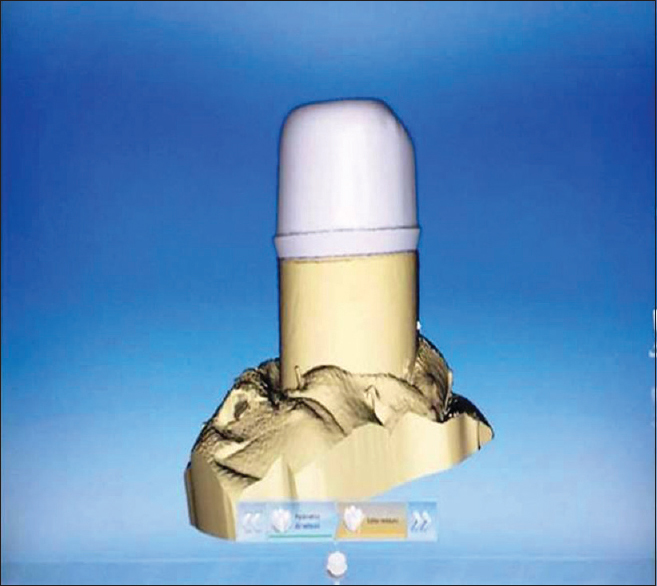 The study evaluated in vitro zirconia crowns manufactured using CAD/CAM with the Zirkonzahn system, and disilicate crowns were made using the injection technique. The results were lithium disilicate showed lower values of marginal adaptation. Two materials analyzed were manufactured using the CAD/CAM system and the marginal adaptation values varied between 113 μm for lithium disilicate and 68.5 μm for zirconia. However, the restorations were milled using different systems, the lithium disilicate was milled using the ED4 system, and the zirconia was fabricated in a milling plant. The marginal fit of lithium disilicate was 133.10 μm and zirconia was 127.34 μm, which was considered clinically acceptable. Studies have suggested that a marginal fit less than 120 μm is clinically acceptable, and a scientifically significant marginal fit value for a crown has not yet been established. The marginal misfit of the ceramics causes retention of dental biofilm, caries, and bone resorption. This limitation of CAD/CAM system ceramics could compensate with resin cements. Resin cements will promote a unique seal between ceramics, enamel, and dentin, thus increasing the ceramic strength and their superior mechanical and aesthetic properties. The present results indicate that the CAD/CAM system still does not present standardized values of marginal discrepancy. They are dependent on the quality of the preparation, the type of scan and system used, and operator dexterity. Although manufacturing a prosthetic device using a computerized system can minimize the number of errors, the final quality still depends on the preparation of the restoration. This work was funded by FAPESP through scientific initiation grants by the process 2014/18721-9. Brunot-Gohin C, Duval JL, Verbeke S, Belanger K, Pezron I, Kugel G, et al. Biocompatibility study of lithium disilicate and zirconium oxide ceramics for esthetic dental abutments. J Periodontal Implant Sci 2016;46:362-71. Zhang Y, Lee JJW, Srikanth R, Lawn BR. Edge chipping and flexural resistance of monolithic ceramics. Dent Mater [Internet] 2013;29:1201-8. Kocaaǧaoǧlu HH, Gürbulak A. An assessment of shear bond strength between ceramic repair systems and different ceramic infrastructures. Scanning [Internet] 2015;37:300-5. Kern M, Sasse M, Wolfart S. Ten-year outcome of three-unit fixed dental prostheses made from monolithic lithium disilicate ceramic. J Am Dent Assoc [Internet] 2012;143:234-40. Chaar MS, Passia N, Kern M. Ten-year clinical outcome of three-unit posterior FDPs made from a glass-infiltrated zirconia reinforced alumina ceramic (In-Ceram Zirconia). J Dent [Internet] 2015;43:512-7. Guess PC, Att W, Strub JR. Zirconia in fixed implant prosthodontics. Clin Implant Dent Relat Res 2012;14:633-45. Zaher AM, Hochstedler JL, Rueggeberg FA, Kee EL. Shear bond strength of zirconia-based ceramics veneered with 2 different techniques. J Prosthet Dent [Internet] 2017;1-7. Sadaqah NR. Ceramic laminate veneers: Materials advances and selection. Open J Stomatol 2014;4:268-79. Souza ROA. Evaluation of the vertical and internal marginal discrepancies of total ceramic crowns made by a CAD/CAM system, varying the cervical term [dissertation]. São José dos Campos; 2007. Ji MK, Park JH, Park SW, Yun KD, Oh GJ, Lim HP. Evaluation of marginal fit of 2 CAD-CAM anatomic contour zirconia crown systems and lithium disilicate glass-ceramic crown. J Adv Prosthodont [Internet] 2015;7:271-7. Batson ER, Cooper LF, Duqum I, Mendonça G. Clinical outcomes of three different crown systems with CAD/CAM technology. J Prosthet Dent [Internet] 2014;112:770-7. Sakornwimon N, Leevailoj C. Clinical marginal fit of zirconia crowns and patients' preferences for impression techniques using intraoral digital scanner versus polyvinyl siloxane material. J Prosthet Dent [Internet] 2017;1-6. Ribeiro ILA, Campos F, Sousa RS, Alves MLL, Rodrigues DM, Souza ROA, et al. Marginal and internal discrepancies of zirconia copings: Effects of milling system and finish line design. Indian J Dent Res 2015;26:15-20.